(East Stroudsburg, PA) – January 18, 2018 – The Pennsylvania Acceleration Awards are designed to recognize and honor organizations and leaders that are driving technology and innovation across the Commonwealth of Pennsylvania. The meeting also included an update from the Project Team regarding the two leading broadband providers in Monroe County: PennTeleData and NCN Data. 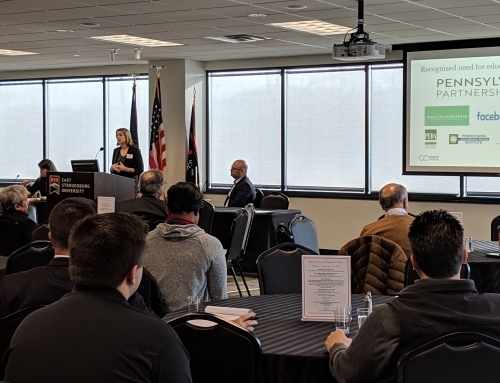 Pennsylvania Acceleration Project Founder Kelly Lewis announced PennTeleData/Blue Ridge Cable currently has an aggressive schedule to deploy gigabit download speeds throughout Monroe County. He explained that many communities in the West End of Monroe County already have these gigabit services. The Borough of Stroudsburg is scheduled for Spring/Summer 2018, he said. Lewis noted that every cable user has seen price reductions. “Residential broadband prices dropped by more than 50% and speeds more than doubled within six months of the Project commencement date,” he said. “This is a huge win for Monroe County,” stated Lewis, “because every user will greatly benefit from these upgrades,” he added. Lewis also reported that NCN Data is doing very well in its expanding footprint. He said NCN Data has started working on pole attachment permits for Readers and Delaware Water Gap areas. In Stroudsburg, they are now full GPON 1 GBPS service to Main Street and have customers online in that area. NCN Data recently completed fiber installation to 8th Street and Ann Streets. Both companies continue to report service upgrades and more aggressive pricing, stated Lewis. Michelle Bisbing, Director of Marketing at the Pocono Mountains Economic Development Corporation offered remarks on behalf of PMEDC. “PMEDC is committed to projects that improve the business climate and infrastructure in the county, and this project did just that. We greatly appreciate the willingness of Lewis Strategic to be our partner in making it happen. Additionally, the diligent work of Kevin Dellicker and Dellicker Strategies was instrumental to the success of the project. This is the third project we have worked on with Kevin and he is a true professional with vast knowledge of the telecommunications industry,” said Bisbing. 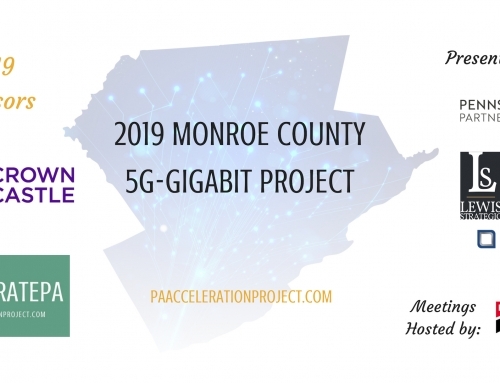 Monroe County Gigabit Project meetings are hosted by the Monroe 2030 Action Team, Pocono Mountains Economic Development Corporation, East Stroudsburg University, and the ESU Center for Research and Economic Development. The PA Acceleration Project is an implementation team speeding broadband, workforce and innovation initiatives across Pennsylvania. The Broadband Implementation team of Dellicker Strategies, Business Information Group and Lewis Strategic has successfully completed nearly 100 regional broadband projects in Pennsylvania and surrounding states. Since 2003, industry-pioneer Dellicker Strategies has led broadband aggregation projects for schools, intermediate units, hospitals, doctors, corporations, agencies and communities. For additional information visit our website, www.PAaccelerationProject.com, and follow Accelerate Pennsylvania on Twitter @AcceleratePenna and on Instagram and Facebook @AcceleratePA.